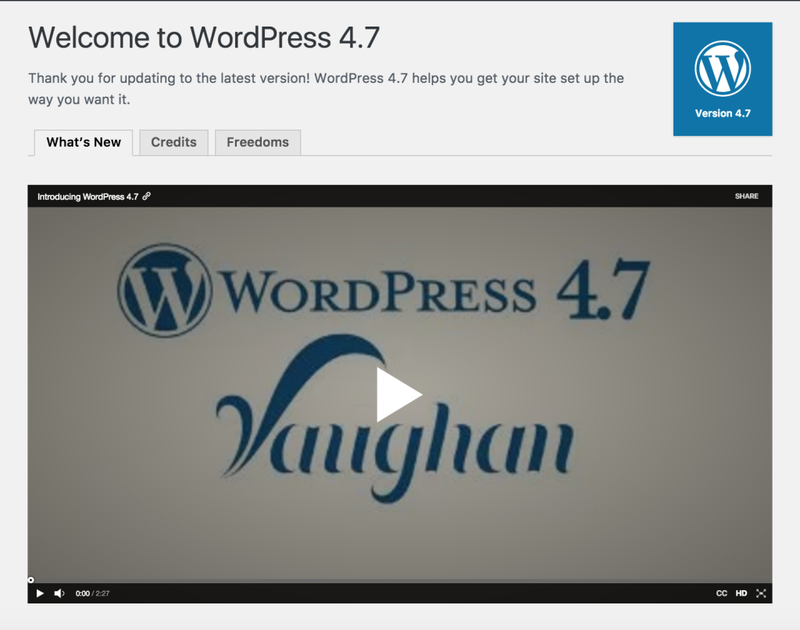 WordPress 4.7 “Vaughan” has just landed honouring the jazz vocalist Sarah Vaughan. It has been just under four months since the last release of WordPress 4.6. There are plenty of great features in this latest release that will help make your WordPress website even better. As a heavy user of WordPress, I’m always excited to see new improvements, but 4.7 is definitely one of the more excitement-worthy releases. In this article, I’ll cover an overview of what’s new in WordPress 4.7, as well as what you can expect to see when you update your site. However, before we dive in, let’s not forget to acknowledge and appreciate the efforts of the team who brought us WordPress 4.7. Thanks to Helen Hou-Sandi who headed up this latest release, alongside Jeff Paul and Aaron Jorbin. They were then further supported by a record number of 482 contributors. Don’t forget perform a full website backup (database and files) before upgrading WordPress 4.7. It’s also worth reviewing if your theme or plugin providers have published anything specifically about WordPress 4.7 support. Where possible, it’s highly recommended to apply updates to a test or staging environment so that you can test the changes before applying them to your live site. If you experience issues, try some basic troubleshooting steps. Charles Costa has shared some tips around fixing common WordPress issues. Don’t forget you can also visit the official WordPress support forum, just make sure you read the welcome post. Given WordPress 4.7 is a major release, you’ll need to manually run this update when you are ready. Each year WordPress releases a new default theme and this year is no different. Twenty Seventeen is a fresh new theme ideal for business websites which features a large header area where you can display either a full screen image or video background. There are also multiple sections on the home page that you can tailor to suit your desired content and images. You can preview just what the new Twenty Seventeen theme looks like for yourself at http://2017.wordpress.net/. WordPress 4.7 now provides developers with the opportunity to include video headers in their themes. Users can then easily update this via the Customizer. The Customizer will now help you through the setup of a theme with a live preview of the changes. With WordPress 4.7 you can now add pages directly within the menu editor, making it easier to build out the structure of your site. When you’re finished, you can simply jump into the pages to add your content. 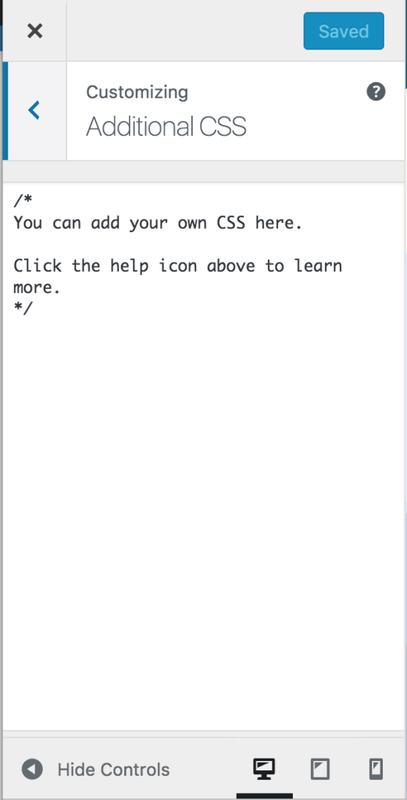 One of the great new features of WordPress 4.7 is the ability to now add some custom CSS directly via the Customizer so you can preview the changes before you publish them. This feature is ideal if you have multiple people managing the site with different native languages. If you would prefer to view the WordPress dashboard in a different language to the default set for the site, you can now control this via the user profile. Now you will be able to view a thumbnail of the first page of your PDF within the Media Library rather than the previous default file icon. You’ll now find REST API endpoints for posts, comments, terms, users, meta, and settings. This new feature provides a great new way for external interaction with WordPress. You can find out more about the WordPress REST API here. There has been a big overhaul of the code that makes up actions and filters in WordPress. You’ll also see that some bugs have also been fixed. You can now list tables with more than just bulk edit and delete. For theme developers, check out the new functions, hooks and behaviour in WordPress 4.7.
register_setting() has been improved to now also have type, description and REST API visibility. There’s now more flexibility for theme developers, as the page template functionality to all post types has been opened up. To find out more about WordPress 4.7, check out the WordPress Codex release notes. At the recent WordCamp US conference held in Philadelphia, Matt Mullenweg mentioned (during his traditional State of the Word talk) that future WordPress releases in 2017 will be handled differently with no set major release dates. I’d love to hear your feedback on this latest release in the comments below. Portions of this article were originally published in the SitePoint WordPress Newsletter, you can subscribe here if you’re interested.